Referred to variously as “Fenway,” “Fenway-Kenmore,” or “Kenmore Square,” the neighborhood most commonly called Kenmore is actually a conglomeration of multiple neighborhoods. 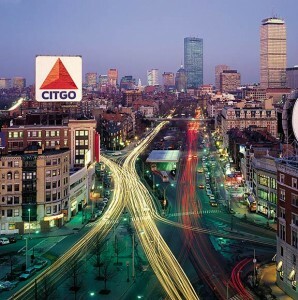 Kenmore is a popular tourist destination in Boston; as the name suggests, the neighborhood is home to Fenway Park and the Red Sox. Kenmore, however, is more than simply a neighborhood around a ballpark. Like the neighboring Back Bay, Kenmore was once an uninhabited section of Boston until land development in the mid-to-late 1800s transformed this swampy marshland into habitable land. Originally considered to be part of the nearby independent township of Brookline, the Kenmore neighborhood officially became part of Boston in 1874 when the town borders were redrawn after Brighton merged with Boston. Construction of the streetcar tracks which would eventually become the Green Line, as well as the completion of the landfill connecting the Back Bay and Kenmore to the rest of the city, allowed the neighborhood to begin development in earnest. Soon after came the construction and opening of Northeastern University as well as Fenway Park and the relocation of Harvard Medical School and Boston University to the area. All of these factors and more helped make Kenmore the thriving and bustling neighborhood it is today. The architectural layout of Kenmore, while not as striking a contrast as that of the Back Bay, is still a remarkable juxtaposition of the past and present. On one hand, many of the buildings in the area are renovated brownstones used for multiple purposes such as apartments, student housing, stores, and offices. On the other, the expansion of the local universities over the years led to the construction of new facilities in the modernist and Brutalist styles (such as the Boston University School of Law tower). Overseeing all of this, of course, is the famous Citgo sign, visible for miles in the city and a prominent part of the view from Fenway Park.